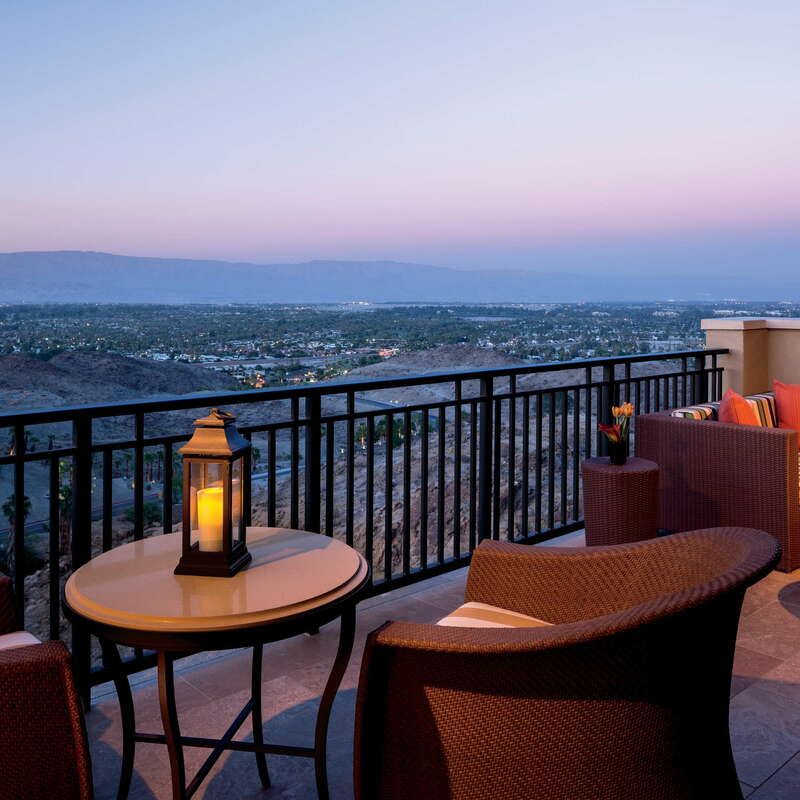 The Ritz Carlton, Rancho Mirage is just down valley from Palm Springs and up valley from Indian Wells, where the annual March tennis tournament is a big annual draw. It’s also literally up a mountainside. As a result, guests will feel more isolated than at other nearby resorts, while still having the luxury of being in a highly accessible location. Speaking of luxury, this brand is known for their high-end offerings and this outpost is no exception. 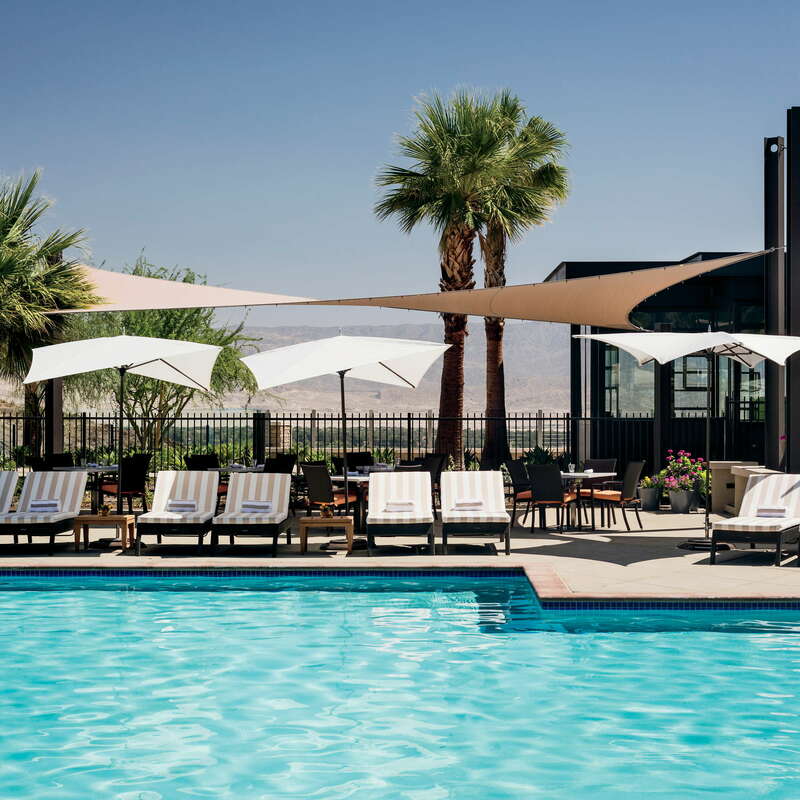 With two restaurants and a pool bar, a spa, and access to low-traffic hiking trails, guests can experience a mix of simple and guilty pleasures. YOU SHOULD KNOW Ritz Carlton is an incredibly dog-friendly brand. All sizes and breeds are accepted at this location for a non-refundable deposit and a maximum of two dogs. 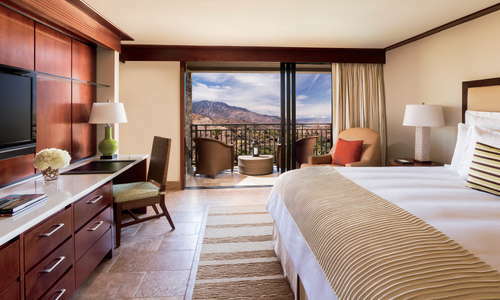 Most of the 244 large rooms have private patios or balconies. 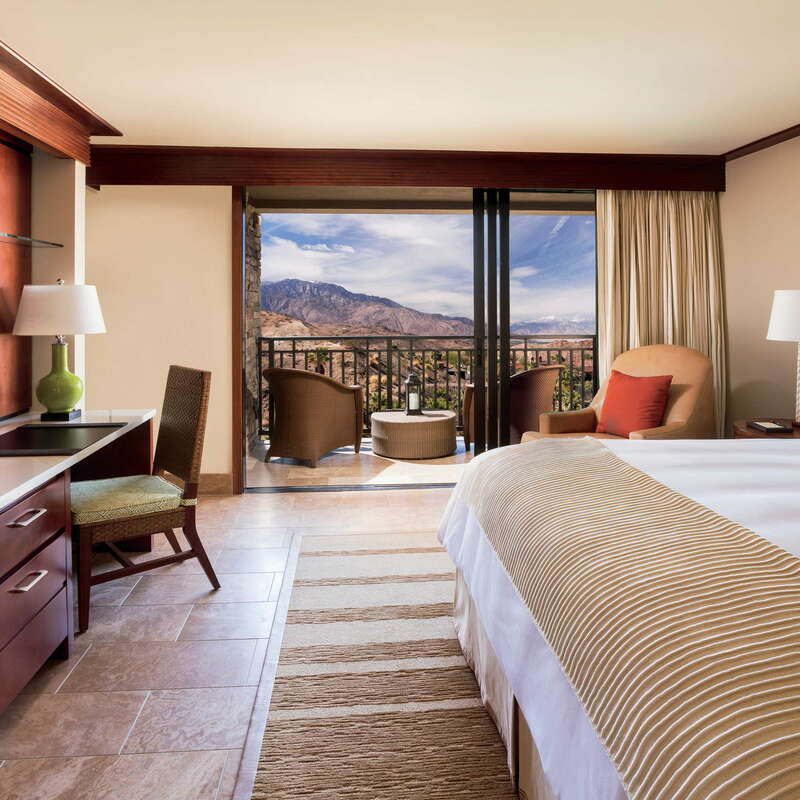 All rooms offer wonderful views of the surrounding landscape and vistas. Wi-Fi is free, and residential suites include gourmet kitchens with appliances by premier brands Wolf® and Viking®. Decor is sophisticated and classic. With garden tubs for soaking and Asprey bath products, guests can relax, especially after a long day of hiking or tennis. 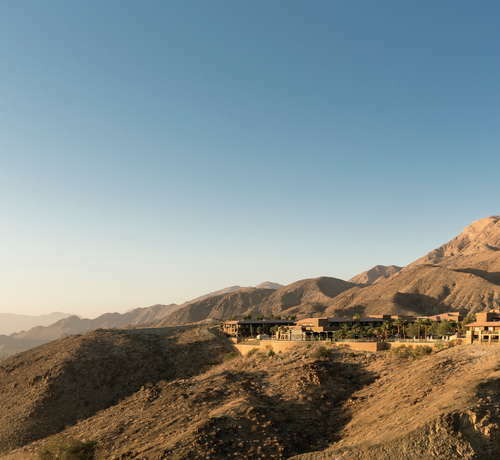 A blend of curated gardens and the natural surrounding desert beauty welcome guests to the resort. Upon entering, large windows continue to highlight the views, while seating placed around a fireplace invites a place to take a load off. The multi-colored brick accent wall behind the front desk mimics the colorscape of the surrounding nature. The Ritz has two pools: one all ages and one for adults only. 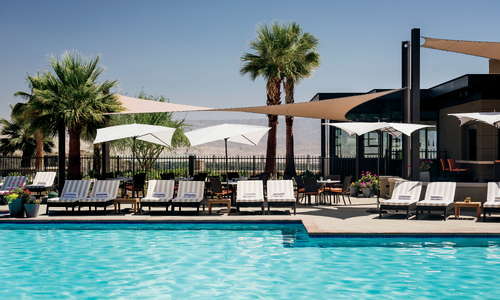 The all-ages pool offers both poolside bar and dining service. 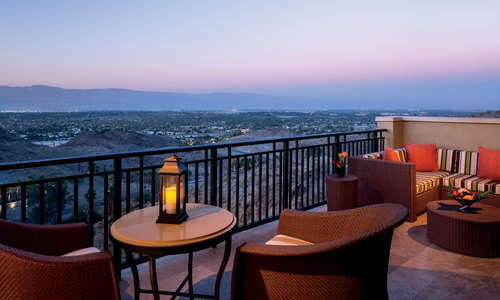 The Vista Pool provides a truly spectacular view of the surrounding Coachella Valley and San Jacinto Mountains. With an emphasis on holistic treatments, the spa offers services like massage, facials, body wraps, and a special menu just for men. Relaxation spaces abound, including plunge pools and private terraces. 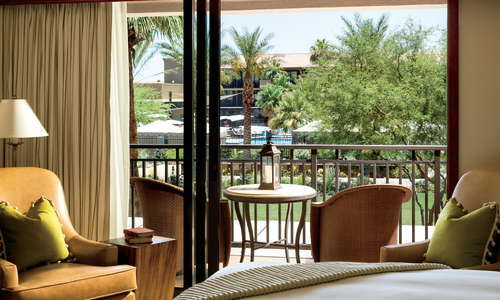 The rare desert resort without a golf course, guests have privileges at several clubs. That said, guests can book personal training or group classes for a fee, or use the abundance of equipment at the well-stocked fitness center. In-room dining is 24 hours. Mod Café serves coffee and a select breakfast menu. The two restaurants offer different experiences, with the farm-to-table State Fare Bar + Kitchen open breakfast, lunch, and dinner, and The Edge Steakhouse only open for dinner service Wednesday through Sunday. At the Air Pool Bar, guests can order lunch, like made-to-order sushi, from late morning through the afternoon. 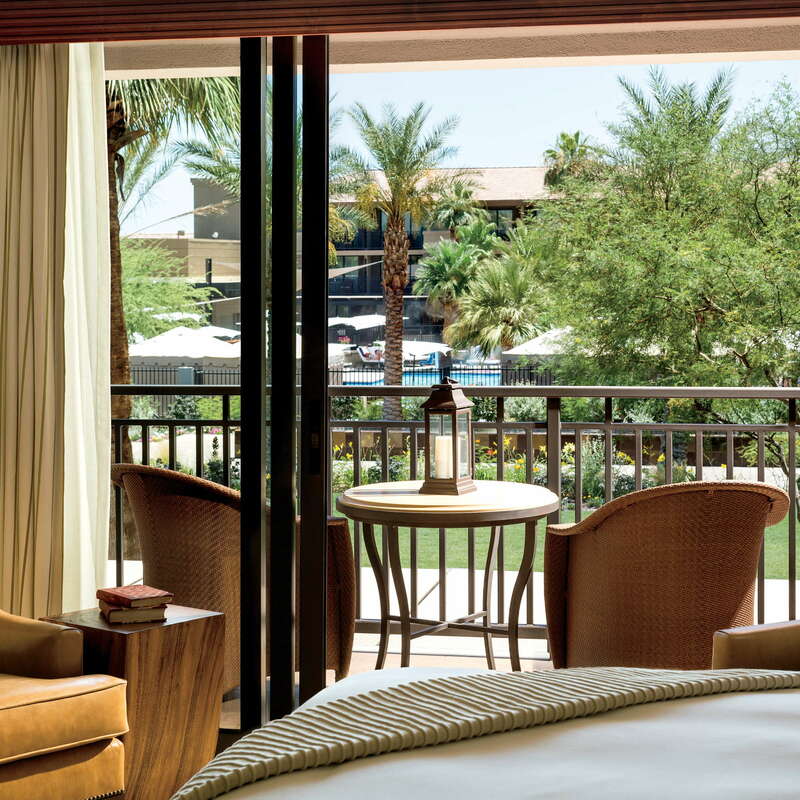 All-day beverage service is offered year-round. At State Fare, the cocktails are made from choice ingredients and small-batch spirits. For wine, visit The Edge Steakhouse. A car is a definite to get to this slightly off-the-beaten path resort. Valet parking is available for $30 per night. Descend down the bluff to find excellent dining options nearby, including the scrumptious tapas and Spanish wines at Catalan Mediterranean Restaurant (4-minute drive). Wally’s Desert Turtle (6-minute drive) offers cuisine from Western Europe in an elegant dining room. For an upscale English dining hall that will make you feel a bit like you’ve traveled to a grand countryside estate, visit the almost half-century-old Lord Fletcher’s (4-minute drive). For the exact opposite experience of the Ritz, visit Red Barn (10-minute drive), a mostly locals dive bar with amazing live entertainment and classic drinking options. A taste of mid-century heyday can be found at Bernie’s Lounge and Supper Club (4-minute drive). The views and access to hiking are sublime and we love the combination of high-end luxury and good old fashioned natural wonder. 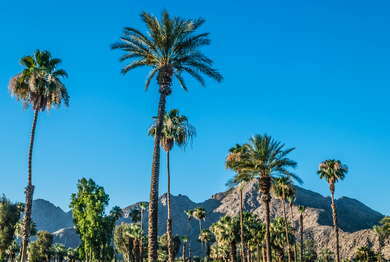 Most guests are older, wealthier, or retired and enjoy experiencing a polished Palm Springs or desert adventure at a comfortable distance. $$ &middot; 598 S Grenfall Rd. $$ &middot; 12689 Eliseo Rd. $$ &middot; 586 S Warm Sands Dr.
$$ &middot; 601 S Grenfall Rd.